The assorted collection of beddings by Swayam are made for everyone no matter their budget. Simplicity is wrapped up, literary, and offered in for grabs. The panoply of household goods and fixtures for the modernized Indian home are available online. This festive season, almost everyone offers discounts on their products be it in the market or the ecommerce webpages. And keeping in lieu that this is the time of the year, when people intend to remove the negativities from their homes and lives and welcome in positive vibes. This is goes for the home-furnishings as well. It’s been a custom of Indian households to change the curtains and table linens during this season. 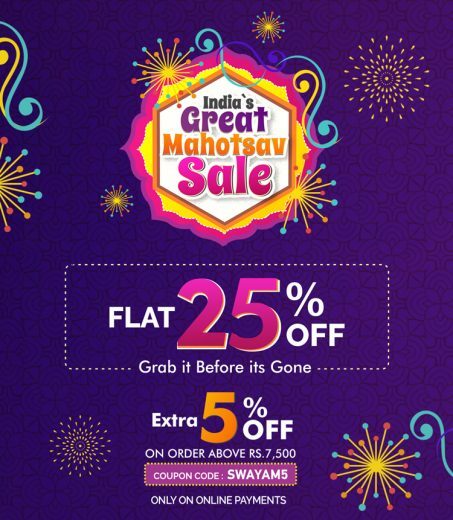 And on order to help every home to get a fresher look, Swayam’s Flat 25% sale is offered. The range of blackout drapes, kids curtains, jacquard ones, mulberry, lounge and shower ones, and so many more to revamp the décor this festival. One can choose from any category and with the 25% discount, will be astonished at the prices. The Turkish delights for Indian taste are these diwan sets. They consists of the cotton bed sheet and accompanied by cushion and bolster covers. These are ideal for the living room to have a lavish place to sit. Take advantage of the slashed prices and gift the homemaker the set of kitchen linens consisting of the: free-sized aprons with the matching hand gloves and napkins for the table. And a pot holder mat in the same print, as well. The whole set doesn’t cost to begin with, and with the discount, will feel like a huge saver. The table linen set and napery consisting of the exquisite table covers, placemats, coasters, napkins and runners. One can either buy the matched set or mix and match with other prints. These are made in the premium quality of cotton and can be easily washed at home. These and many more beddings and accessories for the modernized home of India are available at loot prices. Thus, one mustn’t waste any more time and indulge in the sale for the festivities of flat 25% off.